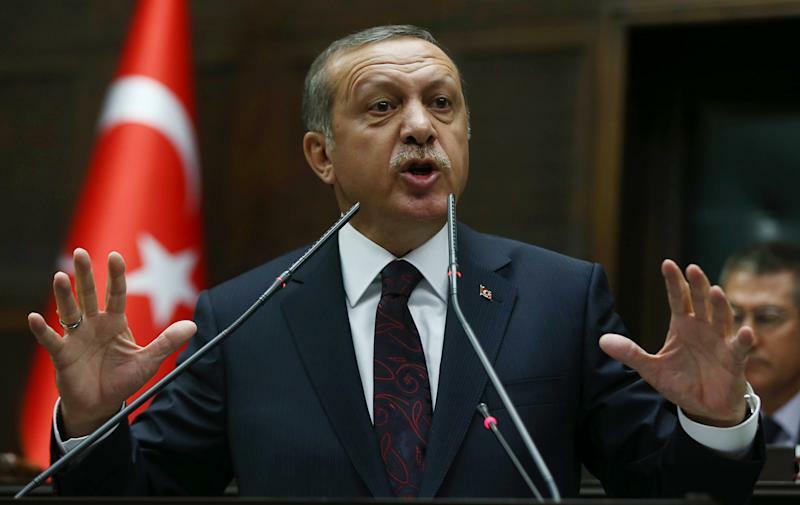 Istanbul (AFP) - Turkish President Recep Tayyip Erdogan Monday told the European Union to "mind its own business", in a blistering attack against the bloc over criticism by EU officials of police raids against opposition media. Turkey has come under fire over the arrests Sunday of over two dozen journalists, television producers, police and even TV drama scriptwriters linked to US-based cleric Fethullah Gulen who has emerged as Erdogan's arch-foe. 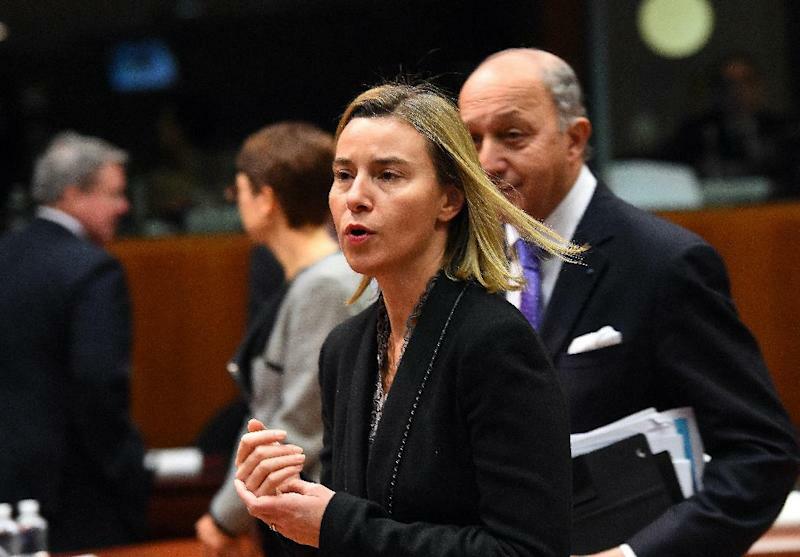 The European Union led the criticism with EU foreign policy chief Federica Mogherini and Enlargement Commissioner Johannes Hahn condemning the raids as "incompatible with the freedom of media". But Erdogan lashed out at the rebuke and indicated that he did not care what impact the arrests would have on Turkey's long-stalled membership bid to join the EU. "The European Union cannot interfere in steps taken... within the rule of law against elements that threaten our national security," Erdogan said in a televised speech in the western Turkish city of Izmit. "They should mind their own business," he added. "I wonder if those who keep this country at the EU doorstep for 50 years know what this step means?" Erdogan asked. "When taking such a step we don't care what the EU might say, or if the EU is going to accept us." His comments risked further damaging ties between the European Union and Turkey -- already strained by Turkish impatience over its glacial-pace membership bid and EU frustration over Turkish policies on Syria. Mogherini -- who had made her first visit to Turkey in her new post to meet Erdogan only a week ago -- said she was "very surprised" by his reaction. Among a total of at least 27 people arrested in the nationwide raids were Ekrem Dumanli, the editor-in-chief of the Zaman daily newspaper, which is closely linked to Gulen, and Hidayet Karaca, the head of the pro-Gulen Samanyolu TV (STV). Also detained were staff including a producer, a director and scriptwriters on popular TV drama series Tek Turkiye (One Turkey) broadcast on STV. The director and two scriptwriters for the TV series were released overnight. The Zaman daily reported that two more detainees were set free on Monday, including the newspaper's columnist Ahmed Sahin. The other suspects were still being questioned by Istanbul police. The state Anatolia news agency said chief public prosecutor Hadi Salihoglu ordered the arrests on charges of forgery, fabricating evidence and "forming a crime syndicate to overtake the sovereignty of the state". Several police were also detained, including the former heads of the Istanbul anti-terrorism and organised crime police departments. US State Department spokeswoman Jen Psaki said Washington urged Turkey to make sure the raids did not violate its "own democratic foundations". Press freedom group the International Federation of Journalists (IFJ) said they were "appalled by this brazen assault on press freedom and Turkish democracy". "Black day for democracy," said Zaman's headline in heavy black letters. But a defiant Erdogan pledged to pursue what he called "enemies of the state" at home and abroad and portrayed the raids as part of "normalisation process". "We know the dimension of the crimes they have committed," he said in a second speech. "Nobody should shed crocodile tears." Deputy Prime Minister Bulent Arinc denied the government had launched the operation. But he added: "These are serious crimes and cannot be justified as freedom of press." Markets reacted with anxiety to the news, with the Turkish lira losing 3.34 percent of its value against the dollar, touching record lows last seen in January this year. Erdogan has accused Gulen, who is based in Pennsylvania, of running a "parallel" state using influence in the police, judiciary, media and schools. The Turkish government has repeatedly asked Washington to extradite Gulen, 73, but to no avail. The crackdown came almost a year to the day after Erdogan's government was rocked by stunning corruption allegations that the authorities denied and blamed on Gulen. The corruption probe -- opened on December 17, 2013 -- saw the arrests of dozens of leading businessmen and political figures close to Erdogan, then prime minister. The last months have seen successive raids against suspected pro-Gulen elements in the police force, but this was the first time media had been so directly targeted.